Summer has hit, and with it a bunch of crazy people going to crazy festivals and (often) burning crazy sculptures to crazy music! In that vein [Matthew Goodman] recently got involved in the burning flipside community down in Texas for his first big effigy build. The project called for a gigantic archway flanked by two human shaped figures, since he had been working in Kinect [Matt] decided to try his hand at physically modeling the figures from Kinect mesh data. After co-registering the depth and image cameras, setting up a capture routine to record, getting .ply based meshes from the depth camera, and making a keypoint detector [Matt] was ready to start getting real world data from the Kinect. Armed with a ghetto steadycam built from his local Austin Hackerspace‘s spare parts bin, [Matt] proceeded to collect three 1.5 gigabyte scans of the charming [KT], who served as a model for the sculpture. Once the meshes were imported to sketchup they could be merged and smoothed into a coherent form. The figure was split into CNC-able parts (known as the “lady bits” by [Matt] and his crew) and sent to local makers [Dave Umlas] and [Marrilee Ratcliff]’s ShopBot CNC mill. The 400 some odd bits of wood were then carted to flipside, methodically set up, and promptly set aflame the end of the event. 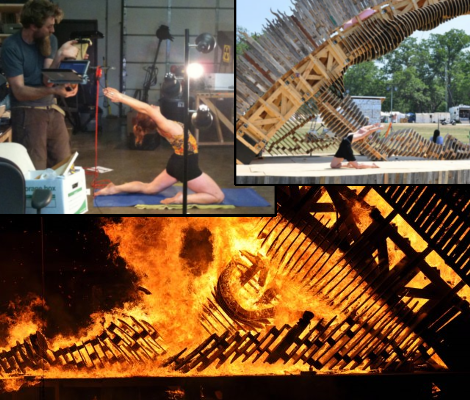 We have seen a couple of really interesting burning man projects, but this is possibly the shortest lived end result. Stay tuned this summer for more insane Black Rock City bound creations as well. Also don’t forget to check out [Matt]’s site for more details. The next time you reach for a cold one, you might want to take a look at the can to ensure that your beer won’t suddenly sprout legs and start skittering across the table. You might remember [Ron Tajima] from some of his previous creations, including this Roomba-based baby cradle and the PacMan Roomba mod. 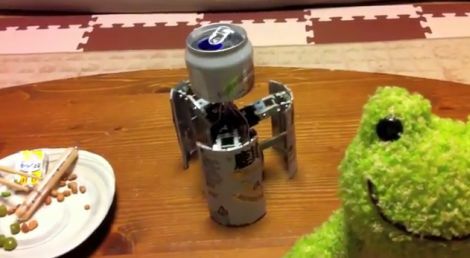 This time around, he has created a cool little transforming robot that fits inside a beer can. The robot’s brains are stored just underneath the top of the beer can on a custom-built board. On one side of this board, you will find an mbed controller which is used to manage all of the robot’s functions, and on the other side, four batteries provide all of the device’s power. The robot’s three legs are controlled by six servos, allowing for movement in several different planes. The beer-bot’s movements are controlled with a Wiimote, so we’re assuming he has crammed a Bluetooth module somewhere in there as well. [Ron] mentions that it moves a bit slowly when standing on end, but we think the robot is pretty awesome as is, and we can’t wait to see what improvements the next version might bring. Stick around to see a video demonstration of the robot in action. While some projects we feature are meant to perform a useful function or make life easier, others such as this art installation by [Pe Lang] are far less functional, but amazing nonetheless. Taking a cue from CNC-style machines, his creation is an experiment in falling objects and the properties of water. The machine methodically moves along a small 370 x 330 mm plate that is constructed out of a special omniphobic material. A syringe full of water travels along with the machine’s arm, depositing a single 3.3 mm wide drop of water on the board every few seconds as it moves along. Due to the surface tension of the water, each droplet forms a near perfect sphere on the plate without disturbing any of its neighbors. Once the machine is finished, it leaves the matrix of water droplets to evaporate, after which the machine starts its careful process once again. It really is amazing, regardless of the fact that it doesn’t exactly “do anything”. Be sure to check out the video below to see the exhibit in action. [Pcdevltd] pulled an all-nighter to get his first Android Developer Kit project up and running. 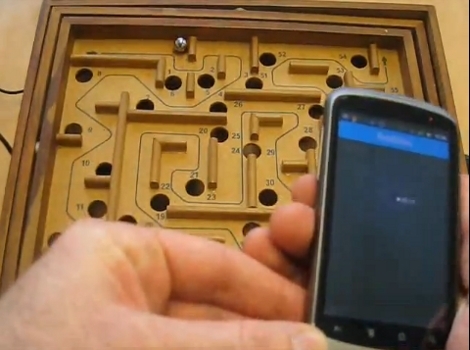 Basing the project off of the example that Google used when unveiling the new accessory development hardware, he set to work controlling a marble labyrinth game using his smart phone. What began at 7pm was wrapped up by 5am to produce the results seen in the video after the break. These ball mazes use two knobs to pivot the playing surface, changing gravity’s pull on the ball to get it to go where you want. [Pcdevltd] pulled off the bottom on his labyrinth and installed two small servo motors. These connect to the Android Open Accessory Development Kit via a small cable. 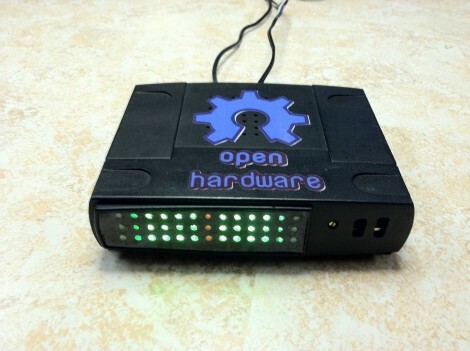 Connect that to the phone and you can then use the internal accelerometer to play the game. If you have an Android phone and an Arduino this should be pretty easy to replicate since we know you can already use the ADK with Arduino. Get to work on your own projects and don’t forget to send us a link to your project log. Some animals seem to be able to detect earthquakes. Some animals also navigate using the earth’s magnetic field. From the idea that there may be some relationship with these two things, this experimental earthquake detector was born. [Bob Davis] built this device, which uses an Arduino and several Hall effect sensors to detect and record magnetic fields. Possibly after enough data is recorded, a correlation can be found between the two phenomena. 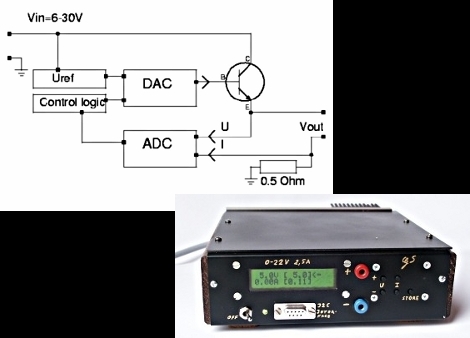 The sensors in this device are arranged to measure magnetism in four directions as well as in the vertical axis. Part of the idea behind this is that before an earthquake the quartz in the ground moves producing a magnetic field.